Love It! 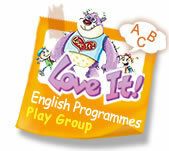 Play Group is our English program aimed at children aged 18 months to 3 years old. We believe it is a fantastic opportunity for children within this age range to begin developing a solid foundation for their burgeoning language skills, to introduce a learning environment and to develop socialization skills. Our Love It! Play Group curriculum aims to stimulate student’s language abilities within a pressure free, exploratory framework. Students actively engage in the learning process with activities and materials that are appropriate to their age and development. Each 10-week program covers 5 themes that contain key vocabulary and grammar patterns chosen to help children develop a sound platform for language learning and overall language development. At Hess we record our own music, DVDs and CDs, ensuring all our themes, vocabulary and sentence patterns are reviewed in song. Each lesson begins with Warm-Up sessions that are designed to re-familiarise a student with the class and the teachers through songs, chants and basic greetings. The English content includes vocabulary and sentence patterns being taught with rhymes, songs, chants and games specifically designed to foster English language development. The lesson covers basic ABC recognition and pronunciation. In addition to English language learning our teachers ensure that the students engage in general Sensory Development. This includes the development of general recognition and gross motor skills through exploration, manipulation and discovery. The use of stimulating games, toys and puzzles fosters this development. Sensory Development is important for creating well-rounded language learners and is essential in helping students develop key life skills. Our Play Group lessons are conducted within the safe and enchanting environment of our beautifully designed Love It! Play Group environment. A safe and stimulating classroom allows students to explore their surroundings without fear, leading to new discoveries. Our Play Group classroom has been set up with this goal in mind. At the Hess Education Centre we believe that students who feel secure, happy and comfortable are able to take full advantage of their learning potential. Love It! Play Group offers a one-day per week program running on Saturdays and Sundays. Our Native Speaking Teachers always have students’ well-being, comfort and needs at heart. Due the nature and age of the students, we ask that a caregiver remain in the classroom with a student at all times. This ensures that a students needs are met swiftly when the need arises. It also enables both caregiver and the student to experience learning together.